This book was provided to me free of charge from TundraBooks in exchange for an honest review. I signed up to review children’s books a while ago, but this is the first time I was actually selected. I was very excited. I love books for all ages, and reading out of my ‘usual’ age group lets me learn about what others are reading and also helps me promote books to friends and family with children in that age group. Reading is reading, after all. This book is beautiful, and resonated with me as a Canadian and of course a lover of hockey. Not just one Canadian team either, there are references throughout the book to many Canadian hockey teams and players. Hockey is something we should be proud of, and something we should learn about. I feel that this book opened up some great discussion topics about the sport in general, while also touching on some more serious topics. Gabe (Gabriella) Murray is a young 9 year old girl, and she loves hockey. All of her life she has wanted to be just like her hero, Hayley Wickenheiser. That’s where the interest starts. Haley Wickenheiser isn’t just a made up character, she’s a real person, the first woman to play full-time professional hockey in a position other than goalie. She wears the number 22. Gabe ends up getting a different number, and she isn’t too pleased by that. She wants to quit and give up – but her grandmother comes along and shows Gabe all of the wonderful things about being the number 9, and explains the significance of numbers that have been retired. The entire book is a lovely learning experience wrapped inside of a happy story about a young girl. The illustrations were detailed but not overpowering, I loved spending time on each page to make sure that I saw everything. 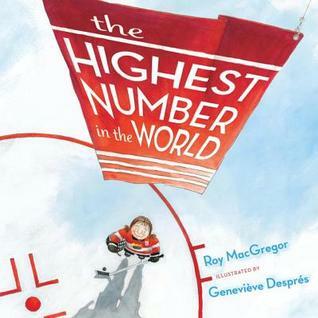 Perfect for children ages 6-10 (boy or girl), this book is a must-read for any fan of hockey or potential future fan.